Morris Walton Leader was born in Marshall, Texas and died in Austin where he moved in his youth. He studied art in New York and Chicago shortly before World War 1. Later in Texas he studied with San Antonio artists Peter Lanz Hohnstedt, Frederick Becker and Harry Anthony DeYoung. 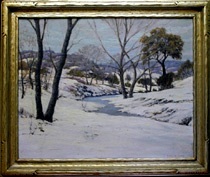 Texas Hill Country landscapes were Leader's specialty, including areas near his home in Austin, including paintings along Shoal Creek, Brushy Creek, the lakes, etc., and traveled through the Hill Country near San Antonio, Medina, Bandera, Kerrville, etc. Exhibits of his include: Witte Museum, San Antonio 1932; Austin Texas Fine Arts Association 1933; Prize 1934, Texas Artists Circuit Exhibitition, etc. His paintings were sold in galleries throughout many parts of the nation.